Much has been written about Prosper de Mestre, and this web site does not hope to cover those aspects of his life which are well covered in history books. The DE MESTRE WEB SITE looks at the de Mestre family in France, and in Australia. I have included some different aspects of the de Mestre family. Prosper's mother, Helene Cottrell (spelt a variety of ways) lived a long and interesting life. I will include some details of her 3 families soon! Ron, Shirley, Nancy and Ian at the back, Elizabeth and Belinda at the front. This web site is not all my own work, it is the combined work of a group of people dedicated to finding the truth about their roots. During the last few years, a group of de Mestre descendants have met each other other due to a common interest in family history. With a common bond, we have shared our research and discovered an amazing wealth of information on Prosper de Mestre and his family. In 2004 we finally all got together in one place . A picnic at St David's Church at Haberfield saw all of us getting on like old friends. Marg and Ron Thompson came from Queensland, Nancy Patterson from Wagga Wagga, Shirley O'Donovan from Sydney, Ian Dobbin from the far north coast of NSW, I came from the Central Coast and Elizabeth Draper travelled with her husband Lewis all the way from France! On this day, we were also joined by quite a few other de Mestre descendants who have shown an interest in the family history. 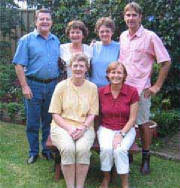 This was the forerunner to a full family reunion at Terara on the Shoalhaven River in 2008. Since then, we have been joined by many others interested in researching the de Mestres, both in Australia and before Prosper's arrival here. Elizabeth has continued the research in France and Maree Amor has been translating French documents and come up with the following. PROSPER de MESTRE'S BIRTH RECORD HAS BEEN FOUND!! After years of research and input from numerous family members, Maree Amor has found a record of Prosper de Mestre's birth - not on a ship or in Martinique as had been thought, but in France! Prosper's baptism took place in Lorient, on 17 August, 1789. This finding is important in that it disproves the family story that Prosper was born on a ship, as he himself stated, and that he was related to the British monarchy. Marg, Nancy, Shirley introducing Elizabeth to lamingtons.